Took only seconds to install. Mr rooms are small and the heat vents are in the floor. Needed something to direct the heat out from under the furniture. Due to the small size of the room, the furniture cannot be placed away from the vents. The vent we got this one for is under a cedar chest that fits flush with the wall and is only 3" high for clearance. We combined it with the bed risers under the legs to get the clearance that we needed to keep the heat from blistering the bottom of the chest. The fact that it is adjustable is a plus because it will not stick out too far and be in the traffic path or too short to properly get the job done. Great product!!! We ordered two of these and they really do what it is intended to do. Now we can put furniture over an air vent and air will not be blocked but come through this vent under the couch or chair or end table etc. Good product. The straight extender is great, just wish they had one that could curve just a little. The plastic is very thin and we had to tape it together to extend it completely. I am not sure how long it will last but it does do the job for now. made out of flimsy plastic, similar to the kind that is used to seal battery packs. we have a couple heat vents under furniture and these force the warm air/cool air out into the room, also great for slider door blinds, forces air into room rather than between blinds and sliders. The furnace vent exender works but unfornately it is NOT as Wide as the furnace vent is wide by about 2 inches and soof the heat escapes the extender. Please try to add two inches to the end that goes over thefurnace vent. I used this under a chest. I was able to cut it down with a pair of heavy shears so that it didn't stick out beyond the edge of the chest. It does help quite a bit to redirect the air out into the room, so it is well worth the money. I did have to duct tape it to the register to keep it in place. It would have been a better product if it had magnets to hold it in place, as some other air deflectors do. It was a very flimsy plastic and I needed to tape the pieces together before using it. I was hoping it would have been a sturdy hard plastic. However, I am using the using it and it is doing the job. And it didn't cost very much. Miles used to carry this item in a heavy duty plastic, this product us similar in design but not as heavy duty. I needed something to divert the hot/cold air away from my bird cages. This works just fine. I wish it had been similar to the one I already had so that they fit together if it needed. I would definitely recommend this to anyone who needs to divert air. I also think they need something to keep them in place if they get kicked by foot traffic. 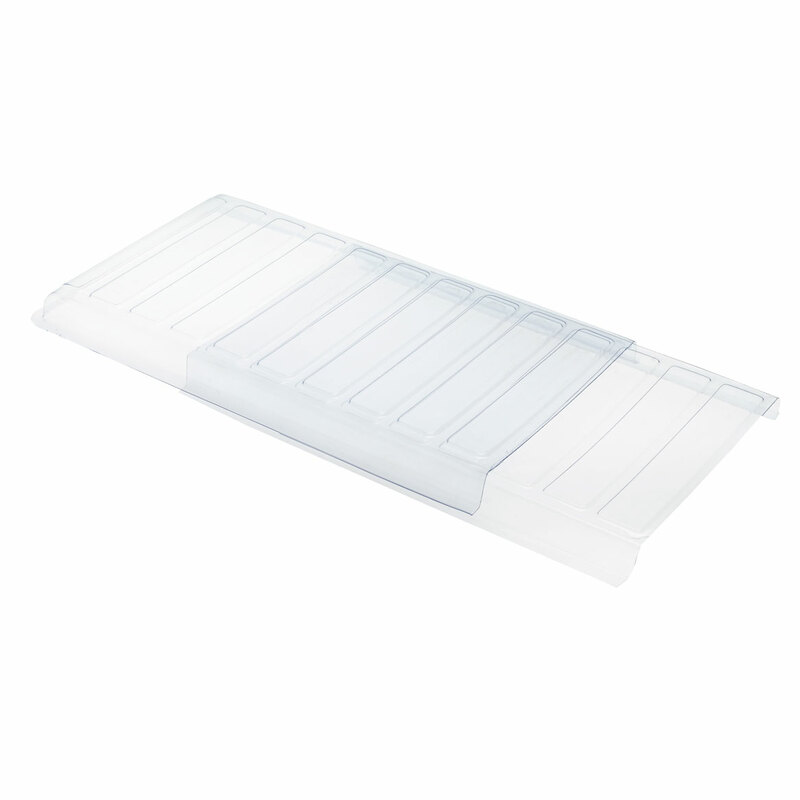 this is very flimsey plastic and is two separate pieces that you lay one on top of the other to adjust the length. They do the job of redirecting air flow, but they would be more functional with magnetic clips to keep them in place over air vents. I should have thought to 1) measure the vents and 2) measure the furniture that this was to go under. Some of the furniture pieces have legs that block me from extending the vent under them. Other than that, it functions as you'd expect. I'm a bit disappointed, but it's the only one I can find, so I will keep it and make it work. Item is quite flimsy and does not have enough height to allow heat to come out . For the price the material is flimsy and there are no magnets or anything else to hold it secure on the vent like other extenders I have purchased. I didn't expect much from this, but I was still disappointed. It is made from very flimsy plastic - only slightly thicker than the plastic you find in most packaging. Also, the two pieces don't actually attach to each other in any way - you extend the vent by sitting one piece on top of the other. Overall, a very flimsy product. I hoped to use this over my existing register. Nothing great about it and it is so cheap it is flimsy. Thumbs down all the way. Save your money it is not worth the price. The only thing I received in the box was some plastic trash, which I guess is the clamshell case for the vent extender. It can't be the vent extender itself, because it's flimsier than the clamshell cases that you cut into when you get something new! I thought I was buying the awesome acrylic vent director that I have over my 1920's vent. I should have trusted the previous reviews on this product. It's not made well and therefore does not work well. This did not fit my vent and when the furnace comes on it just flies up and off the vent. I expected it to be a hard plastic. I want my money back on this one. Very cheaply made. Was not the width of a register and did not extend enough to be effective. Wanted it to extend from the register to the width of the couch. Only went 1/2 way. and I am returning it! I don't know why other reviewers like this so much. My experience is that it barely diverts any heat out from under my couch. I feel the air needs a gradually lower to bigger opening. I used an aluminum cookie tray to start the air diversion. Then a paint tray is trimmed and taped onto the end of that. Now I have a good amount of warm air coming out from under my couch. Have something to hold it in place. No way to "attach" it to the existing register. product melted within a few days. I didn't feel this was worth buying, there didn't seem to be anything to this product. I have it under my couch. To start; the vent was about three inches too short and must be used opposite the way the directions state. Also the plastic is so flimsy that I'm not sure if it will be able to survive the heat from the register. I have furniture that covers a vent in a location in need of the heat. This item should help. Myy sofa sits overr the living room heating vent. I have a vent behind my sofa that's heating the back of the sofa and wall, thought this would help. Don't see it available at local sources....plus offered free shipping. Need to redirect heat airflow into the middle of the room. Need to get air from behind the new couch into the room. Have used these before and loved them! It appeared to be heavier plastic than the versions offered at Amazon. I just got a cabinet for the bathroom that is right over the vent. This will divert the heat into the room. It will fit under a shelving unit in one of my rooms. Have a dresser over a heat register and need to divert the air. I think the price of the shipping is to much. Plastic doesn't weigh that much. need to extend heat vent out from underneath a nightstand. Have used these before and they are great. This item will allow me to push my couch back to the wall without compromising the heat in the room. I have used one of these for years and I love it. I bought two more for other rooms. It was needed due to home remodeling. I have an older/smaller home and the vents are always under the furniture. Searched Google and saw these on Pinterest. So I Googled the extender and Walter Drake came up. Thanks Google and Walter Drake. I can make this work. WE TO GET A HARD WINTER HERE IN THE OHIO AREA, AND IN MY NEW HOME THE HEAT VENT IS UNDER MY SOFA. AND CAN'T FIND IT IN NY STORE HERE IN OHIO. I need this product for the vent under the couch. Walter Drake has the best price and selection of products. We have several pieces of furniture that block our vents. So we needed something like this to solve the problem. Walter Drake is the only place we've seen them available. Walter Drake came through for us again! This is just what I needed for under my sofa. how does it secure to the vent? I use the curved vent directors which have a magnet so it attaches to the actual floor vent. With these extenders, I just set them under the curved part so it can go under the tv stand and out into the living room. It works well under our couch too so the living room stays warm instead of just the couch! I have several extenders that I use throughout the house, under my bed, under furniture pieces, with little problems, however, magnets on the extenders would make them more secure on the vent. 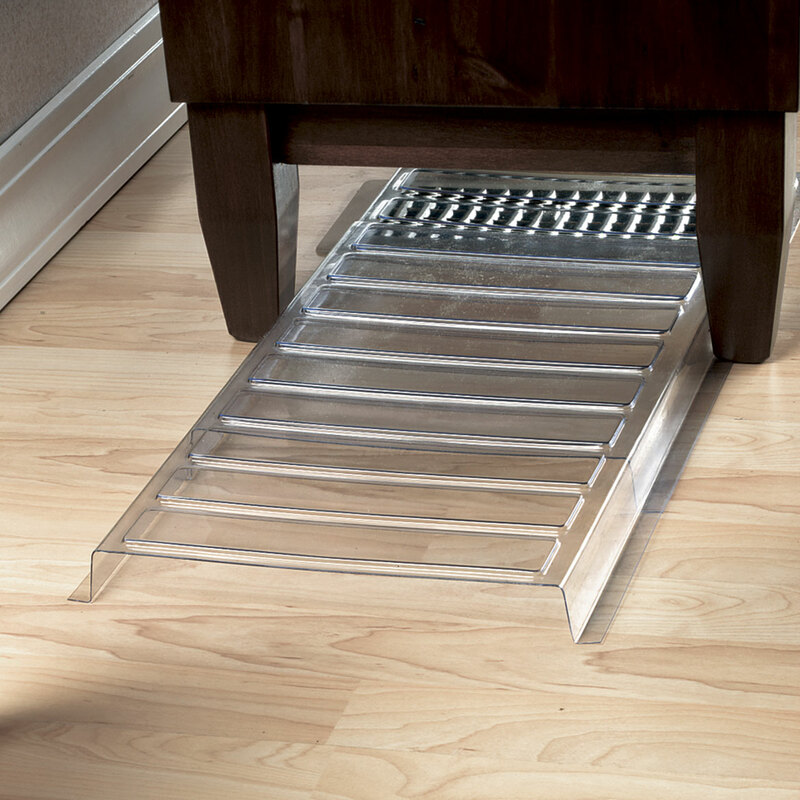 Works well to move the air out from under the furniture but it moves easily if bumped or hit with anything. It must be secured with something else or protected in some way from movement. It doesn't come with anything, but I found a couple small strips of magnet work well as long as you don't bump it. Place a piece of tape along edge of vent to floor. Works great. does heating vent extender have magnets to hold it on the vent? BEST ANSWER: The heat extenders do not have magnets on them which would be a great addition. I use several extenders throughout my house with no major problems but magnets would certainly help secure them to the vent. No. but ours doesn’t move around – if you had cats who got under the furniture it might be a problem, but we don’t’ mess around under the furniture and the air pressure of the furnace doesn’t move ours. This extender does not need magnets, it lays flat on the floor and stays in place. I like this extender and would recommend it. No it doesn't, but it is extra wide so it covers our vent well. No, it does not. The smaller plastic ones do. no magnets and it didn't work verey well. my couch covers my wall vent...will this product work or is there one out there? BEST ANSWER: I don't think this one will work. We have floor vents and we use a curved, ordinary vent cover with magnets on each side which pushed the hot air into our couch. With the extender, I placed it within the curve of the cover and it pushes the hot air under the couch and out to the front of it. I really like it. It actually does work! It is not totally unbreakable, though. I stepped on the first one by accident, and it did break. But it really helps send the warm air out into the room, instead of into the couch. I need the width of 24 inches. where can i find that width? BEST ANSWER: Thank you for your question. We do not know where you would look, we suggest you try Amazon. We hope this information will be of help to you. My vent is about 3 feet long in size. Do you have any wider extenders for larger vents? BEST ANSWER: Thank you for your question. No, this is the only size extender we have. We hope this information will be of help to you. could this be adjusted some way to work on a wall vent? BEST ANSWER: You would have to mount it on to the wall using screws or very good double stick tape (because of the air pressure from vent) if the vent is flush, if not no way. HOW DO YOU SHORTEN THE LENGTH? BEST ANSWER: Thank you for your question. The length is not adjustable. We hope this information will be of help to you. Is there a dimension of this product? BEST ANSWER: Thank you for your question. It measures 11" W x 1" H and expands from 20-36". We hope this information will be of help to you.